From our Premium collection, our Amazing New Farmer Gnome Riding on a Tractor is one of the nicest gnomes we've every carried. Incredible detail, this figurine is a work of art for the most discriminating gnome collector. 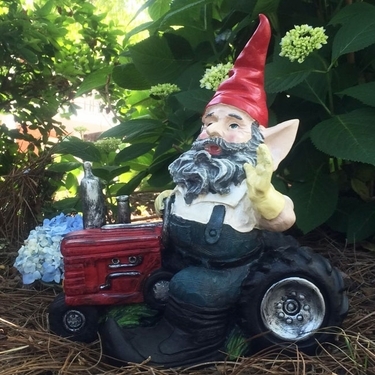 Overalls, gloves and boots and of course his Red Tractor, this Farming Gnome will take care of all the land in and around your farm, barn, and garden paradise. Size: 12" Tall, Weather-Resistant Cast Stone Resin.